In honor of Mel Bartholomew, today's Rookie Topic is Marigolds. They sound simple enough to grow, stick in the ground, water occasionally, and just let the go, but that's not always the case. What kind do you want, what do you want them for, do you really need to know all the technical stuff? The answer to the first two are up to you, but the answer to the last question is no, not really, but in my third year of growing Marigolds I have learned a few things first hand that I wish I had known, and I really do want to pass the information along. Marigolds are like the Opera (per Richard Gere's quote about the opera in Pretty Woman) "You either love them, or learn to appreciate them". I am not a huge fan of them, and in fact hated them until I read Mel's book on SFGing and another book about companion planting and decided to try again. I then learned to appreciate them, and have even begun to see their beauty, even if I still hate the smell. They are still not my favorite flower, mostly because of their scent, but however they do earn their keep. Marigolds are a member of the Tagetes family, which is in the Sunflower family. They are native to North and South America, but are now grown all over the world. It is also considered a non-invasive plant, but stick with me and see how mine get out of hand very easily. Tagetes species vary in size from 0.01-2.2 m tall. They have pinnate green leaves. Blooms are naturally in golden, orange, yellow, and white colors, often with maroon highlights. Floral heads are typically (0.1-) to 4–6 cm diameter, generally with both ray florets and disc florets. In horticulture they tend to be planted as annuals, although the perennial species are gaining popularity. Depending on the species, Tagetes grow well in almost any sort of soil. Most horticultural selections grow best in soil with good drainage. The common English name means "Mary's Gold", but in Nepal it's name means "Hundred Leaf Flower". The more common types are Mexican Marigold, African Marigold, and French Marigold, although all originate from North & South America. Depending on the species, marigold foliage has a musky, pungent scent, though some varieties have been bred to be scentless. It is said to deter some common insect pests, as well as nematodes. Tagetes are hence often used in companion planting for tomato, eggplant, chili pepper, tobacco and potato. Some of the perennial species are deer-, rabbit-, rodent- and peccary-resistant. T. minuta (Khakibush or Huacatay), originally from South America, has been used as a source of essential oil for the perfume industry known as tagette, and as a flavourant in the food and tobacco industries. It is commonly cultivated in South Africa, where the species is also a useful pioneer plant in the reclamation of disturbed land. The florets of Tagetes erecta are rich in the orange-yellow carotenoid lutein and are used as a food colour (INS-Number E161b) in the European Union for foods such as pasta, vegetable oil, margarine, mayonnaise, salad dressing, baked goods, confectionary, dairy products, ice cream, yogurt, citrus juice and mustard. In the United States, however, the powders and extracts are only approved as colorants in poultry feed. Marigolds are recorded as a food plant for some Lepidoptera caterpillars including the Dot Moth, and a nectar source for other Butterflies. They are often part of Butterfly gardening plantings. Marigolds are often used for science projects. They can be used in so many ways. If you notice beans and peas are not on that companion planting list, I've read it's a no-no as they do not play nice together. Actually the roots of the Marigold are said to act as a repellent to beans. I do have one or two near some beans, but they seem to be playing nice so far, we'll see. Marigolds are easy to grow and have a long flowering period. African marigolds have a upright growth and can reach a height of 30-40 inches, while French marigolds grow to only 8-16 inches. The scent is strong and somewhat unpleasant, and is effective in repelling many garden pests. African marigolds come in shades of yellow and orange, while French marigolds are often multicolored in shades of orange, yellow, mahogany and crimson. Both are suitable for massed plantings or pots. They are attractive as cut flowers if the scent isn't a problem. Change the water in the vase frequently. HA, I measure my Marigolds by the foot, not inches. Which is what lead me to write about this, I have already trimmed mine back 3 times this year because they were not only crowding their neighbors, but shading plants that did not need shade. See, it may say DWARF on the plant tag, and some will insist that it truly does mean the size of the plant, but it's been my personal experience (and I read this in Mel's ANSFG book -on the second read) that dwarf means more the size of the flower than the plant. Also, saving from seed can cause it to revert back to some original characteristics. If you do save seeds for this, I highly recommend tossing these in the freezer, the only one's I got to grow from saved seeds were the ones I left in the garden. Also note, it is the root system that usually repels the bugs, so you will probably get better results the second year you plant them than the first year. Here is a link to a "just the facts" page about Marigolds. And before I share a few pictures, I wanted to add, next year the boxes that will have Marigolds will only get 1 plant in the FAR corner of that square, I did five per square this year and it is way to much in some of them. 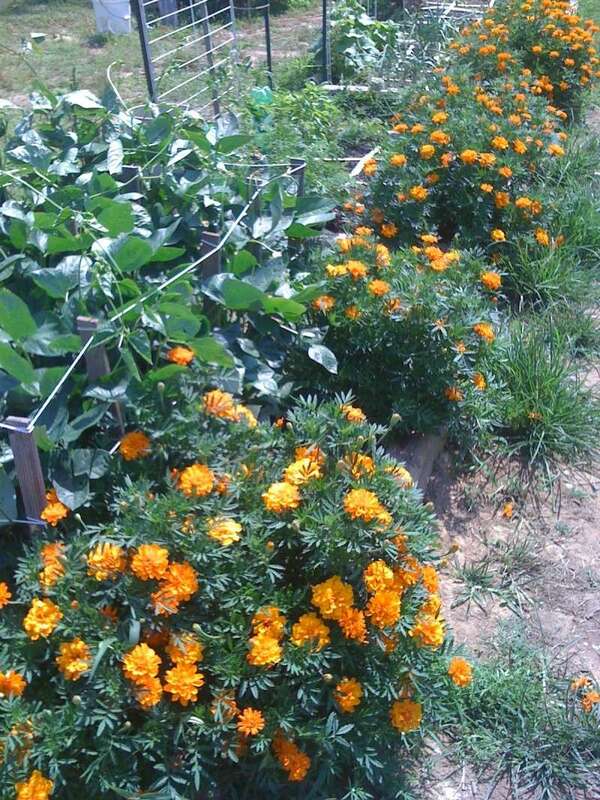 Okay, here are some of my Marigolds. I purchased 2 plants last year from Lowe's, they were on the half price rack, and I nursed them back to health using fish emulsion. These are from the seeds I saved. You can't see them, but there are 2 pepper plants between the Marigolds in the front box, this is 5 plants per square, the peas behind them are over 2' tall. I did eventually pull these up, because I put beans in this box with the corn, but you can see how the spread. This is what they looked like a month ago, I keep these thinned out to 3 per square, and keep them cut back, I don't want these peppers (tequila sunrise) getting too much shade. Share your pictures and experiences with Marigolds. Excellent! I'm trying marigolds for the first time this year. 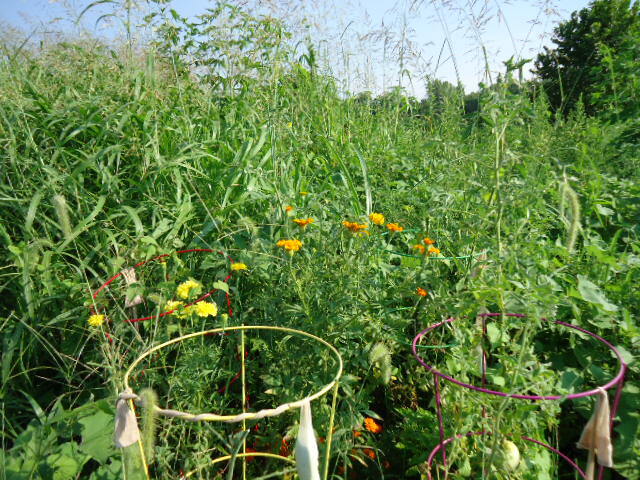 Share your pictures Dizzy, I'm headed out to de-bug the squash in a minute, and get a picture of my black-eyed peas to update the pea topic, as well as get a picture of those marigolds that are hiding my peppers, then I'll trim the buggers again. Great post Val!! I really look forward to these Friday topics. I'm planning on putting small marigolds - just one each - at the junctions of my tomato squares. I know they're great companion plants in general, but in my case I'm doing it because last summer we lost three or four pepper plants to curly top, and marigolds supposedly repel the beet leafhopper. We bought a bunch last year after the trouble started and scattered them amongst the containers and the problem stopped immediately, like flipping a light switch, so I'd call it another successful use of them! Well, I have some planted in containers out by my beans and corn. They were doing great and then one night last week I woke up and went out to the garden and all of the flowers had been ripped off. I've never seen anything bother marigolds before. The ones in boxes on my deck are fine, just the two pots in the garden were disturbed. I'm guessing it was probably birds (probably the stinky starlings) as the petals were scattered all over and the bunny in our yard isn't big enough to get into these pots. Normally I'd blame my almost 3-year old daughter, but she wasn't anywhere near them. It was the weirdest thing... Fortunately, they are marigolds and have survived a frost/freeze already and are still going. I'm sure they will continue. I planted them in hopes of warding off the Mexican Bean Beetles that took over last year. I've only just transplanted them, but I'll take pictures when I can. We have a thunderstorm rolling in right now though. Oh Dizzy, how I wish you could send the rain our way, I'd promise to send it to West TX and then on to AZ. I planted marigold seeds into a long flower container and then transplanted them along one side of my 4 x 4's. I also planted them between my tomato plants. They have been growing like gangbusters! I probrably have around 15 plants growing well even with the hot weather in the 90's. I just finally read this thread and it was fantastic. Thanks Valerie. Nice choice of topic, FV! My mom used to let marigolds naturalize. I remember her planting them in some huge brick planters we had years back. But, she planted fewer and fewer each passing year, but grew more and more thanks to Flower Power (where's the "peace" smiley?). How did I miss the Rookie Topic on MARIGOLDS??? LOVE MY MARIGOLDS - EVEN THE SCENT! (I know, I am crazy, but I really do love the way they smell!) Every year I look forward to seeing where my marigolds have reseeded themselves in my garden, yard, lawn, etc. Sometimes Hubby accidentally mows some, but they come right back. I scatter the seeds as far and wide as possible and just pull up what grows whre I really can't have it. They are great around compost bins. They must be doing their jobs because I have had no pest problems other than a few bunnies, and the bunnies struck before the marigolds grew. Next year I am going to start a whole tray of them indoors so that I can put them out with my first plantings instead of waiting for volunteers to come up. I love the scent of Marigolds too. I never appreciated them until I grew them for the 1st time this year. I just wanted to give 4-H a plug here. My kids are 4-Her's and they sell flowers for their fundraiser. No, don't buy from us but rather - please call your local Ext office and see if the 4H kids are doing a flower sale. It's a win-win situation. We win with a great flower for the garden and the kids win by earning money for their club for activities. Last year I put some marigolds throughout the box and they took off like crazy. Scissor pruned them heavily and continuously to stay inside their 1 foot squares, didn't care they came back even stronger. Repeatedly took all the dried flower heads, crushed them open and threw seeds over the surface of an 8x4ft box all summer long. Crushing dried flower heads created quite a temporary stink for any insects that don't like the odor. The seeds kept reseeding like crazy so I began transplanting them into the flower beds. Moral to this story if you want marigolds they will go bezerk in Mel's Mix. Years ago someone told my mother about marigolds repelling rabbits. She had always grown them in the front and side yards, but decided to put some in back at the edges of her vegetable garden. One evening she looked out and saw the rabbit making a meal of marigolds. Going by the looks of them, I think hers were the french dwarf marigolds which I found in Lowe's. I bought some plants of those and put them in the half squares you see in the front edge of my garden. Marigolds are like the Opera (per Richard Gere's quote about the opera in Pretty Woman) "You either love them, or learn to appreciate them". ... Marigolds are a member of the Tagetes family, which is in the Sunflower family. Interesting about them being in the sunflower family because sunflowers are my favorite flower. I never knew that. @FarmerValerie wrote: In honor of Mel Bartholomew, today's Rookie Topic is Marigolds. They sound simple enough to grow, stick in the ground, water occasionally, and just let the go, but that's not always the case. What kind do you want, what do you want them for, do you really need to know all the technical stuff? The answer to the first two are up to you, but the answer to the last question is no, not really, but in my third year of growing Marigolds I have learned a few things first hand that I wish I had known, and I really do want to pass the information along. Marigolds are like the Opera (per Richard Gere's quote about the opera in Pretty Woman) "You either love them, or learn to appreciate them". I am not a huge fan of them, and in fact hated them until I read Mel's book on SFGing and another book about companion planting and decided to try again. I then learned to appreciate them, and have even begun to see their beauty, even if I still hate the smell. They are still not my favorite flower, mostly because of their scent, but however they do earn their keep. Marigolds are a member of the Tagetes family, which is in the Sunflower family. They are native to North and South America, but are now grown all over the world. It is also considered a non-invasive plant, but stick with me and see how mine get out of hand very easily. From Wikipedia.DescriptionTagetes species vary in size from 0.01-2.2 m tall. They have pinnate green leaves. Blooms are naturally in golden, orange, yellow, and white colors, often with maroon highlights. Floral heads are typically (0.1-) to 4–6 cm diameter, generally with both ray florets and disc florets. In horticulture they tend to be planted as annuals, although the perennial species are gaining popularity.Depending on the species, Tagetes grow well in almost any sort of soil. Most horticultural selections grow best in soil with good drainage. Pasted from The common English name means "Mary's Gold", but in Nepal it's name means "Hundred Leaf Flower". The more common types are Mexican Marigold, African Marigold, and French Marigold, although all originate from North & South America. 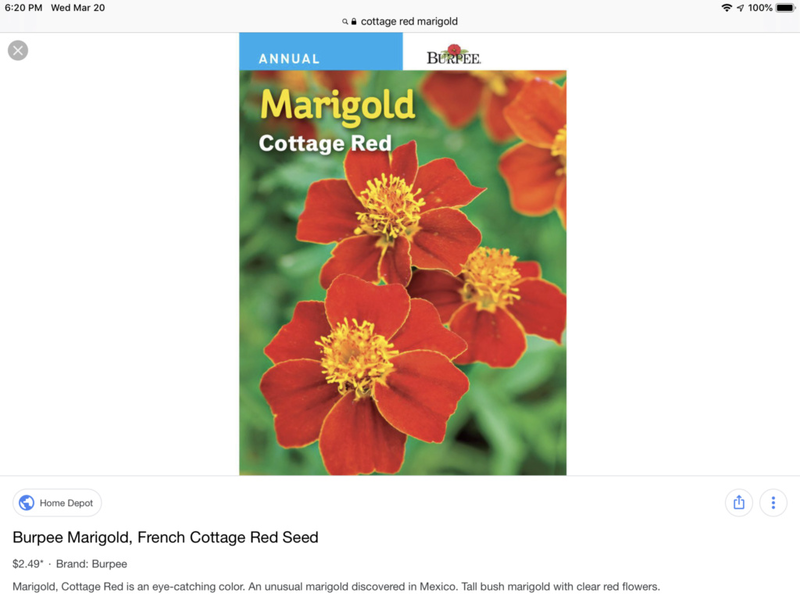 More from Wikipedia….Cultivation and usesDepending on the species, marigold foliage has a musky, pungent scent, though some varieties have been bred to be scentless. It is said to deter some common insect pests, as well as nematodes. Tagetes are hence often used in companion planting for tomato, eggplant, chili pepper, tobacco and potato. Some of the perennial species are deer-, rabbit-, rodent- and peccary-resistant.T. minuta (Khakibush or Huacatay), originally from South America, has been used as a source of essential oil for the perfume industry known as tagette, and as a flavourant in the food and tobacco industries. It is commonly cultivated in South Africa, where the species is also a useful pioneer plant in the reclamation of disturbed land.The florets of Tagetes erecta are rich in the orange-yellow carotenoid lutein and are used as a food colour (INS-Number E161b) in the European Union for foods such as pasta, vegetable oil, margarine, mayonnaise, salad dressing, baked goods, confectionary, dairy products, ice cream, yogurt, citrus juice and mustard. In the United States, however, the powders and extracts are only approved as colorants in poultry feed.Marigolds are recorded as a food plant for some Lepidoptera caterpillars including the Dot Moth, and a nectar source for other Butterflies. They are often part of Butterfly gardening plantings.Marigolds are often used for science projects. They can be used in so many ways. Pasted from If you notice beans and peas are not on that companion planting list, I've read it's a no-no as they do not play nice together. Actually the roots of the Marigold are said to act as a repellent to beans. I do have one or two near some beans, but they seem to be playing nice so far, we'll see. From Garden Guides….Marigolds are easy to grow and have a long flowering period. African marigolds have a upright growth and can reach a height of 30-40 inches, while French marigolds grow to only 8-16 inches. The scent is strong and somewhat unpleasant, and is effective in repelling many garden pests. African marigolds come in shades of yellow and orange, while French marigolds are often multicolored in shades of orange, yellow, mahogany and crimson. Both are suitable for massed plantings or pots. They are attractive as cut flowers if the scent isn't a problem. Change the water in the vase frequently. Read more: Marigold | Garden Guides http://www.gardenguides.com/92-marigold-garden-basics-flower-annual-tagetes-patula.html#ixzz1Otl6Z7XR HA, I measure my Marigolds by the foot, not inches. Which is what lead me to write about this, I have already trimmed mine back 3 times this year because they were not only crowding their neighbors, but shading plants that did not need shade. See, it may say DWARF on the plant tag, and some will insist that it truly does mean the size of the plant, but it's been my personal experience (and I read this in Mel's ANSFG book -on the second read) that dwarf means more the size of the flower than the plant. Also, saving from seed can cause it to revert back to some original characteristics. If you do save seeds for this, I highly recommend tossing these in the freezer, the only one's I got to grow from saved seeds were the ones I left in the garden. Also note, it is the root system that usually repels the bugs, so you will probably get better results the second year you plant them than the first year. 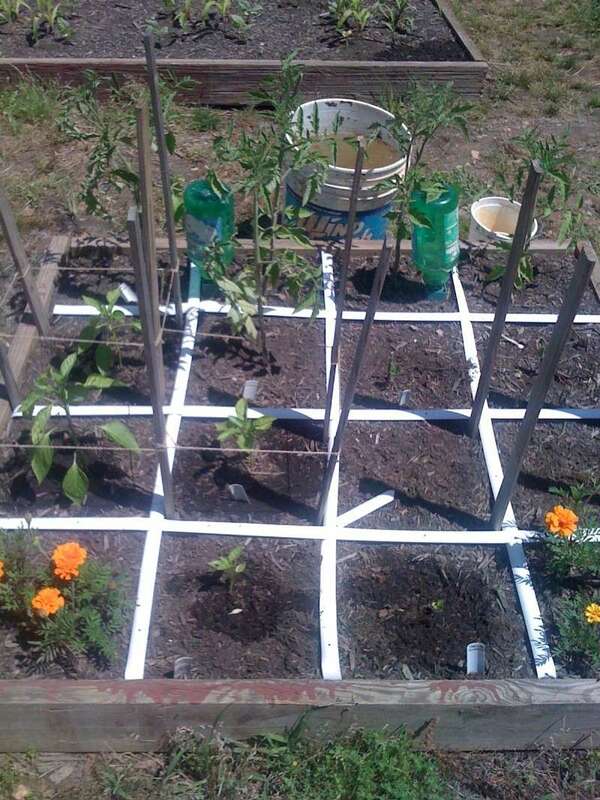 Here is a link to a "just the facts" page about Marigolds.http://www.wvu.edu/~agexten/hortcult/flowers/marigold.htm And before I share a few pictures, I wanted to add, next year the boxes that will have Marigolds will only get 1 plant in the FAR corner of that square, I did five per square this year and it is way to much in some of them. Okay, here are some of my Marigolds. I purchased 2 plants last year from Lowe's, they were on the half price rack, and I nursed them back to health using fish emulsion. These are from the seeds I saved.You can't see them, but there are 2 pepper plants between the Marigolds in the front box, this is 5 plants per square, the peas behind them are over 2' tall. I did eventually pull these up, because I put beans in this box with the corn, but you can see how the spread. This is what they looked like a month ago, I keep these thinned out to 3 per square, and keep them cut back, I don't want these peppers (tequila sunrise) getting too much shade. Share your pictures and experiences with Marigolds. So, could I put a square of marigolds in with the onions and radishes in my new Deer-Be-Gone garden or would Bambi's cousins just laugh at me? I didn't even think about the deer when I was talking about edging the pool with marigolds. 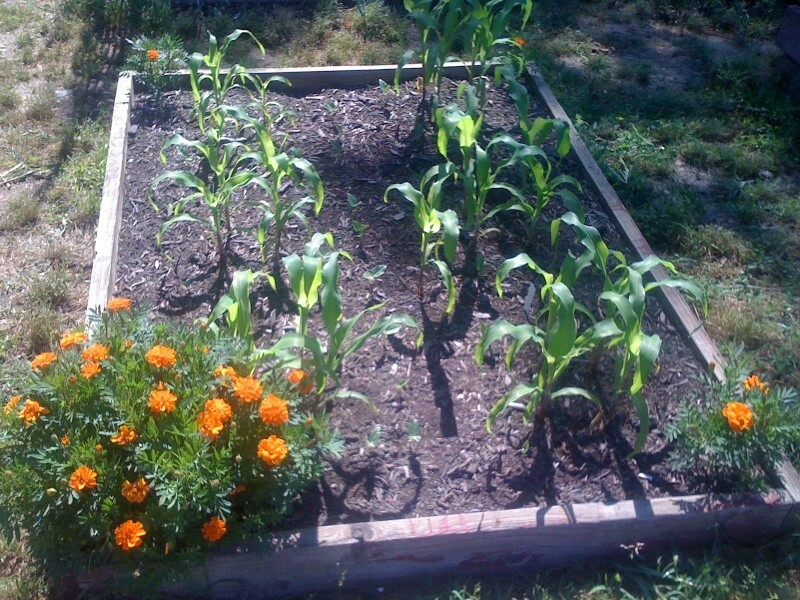 @countrynaturals wrote: So, could I put a square of marigolds in with the onions and radishes in my new Deer-Be-Gone garden or would Bambi's cousins just laugh at me? I didn't even think about the deer when I was talking about edging the pool with marigolds. I always plant Marigolds among my vegetables to repel insects and prevent root knot nematodes, and I can honestly say the deer have never eaten one single Marigold. They did eat some of the beans, lettuce, chard, etc., planted next to the Marigolds, but they never ate the Marigolds. YEE-HAH! Outstanding news. I already planted 50 marigolds. I think I'll make it an even 100. I can't wait until our backyard is full of color. Love love love marigolds. Especially Cottage Red by Burpee. I had literally 3 seeds. Hands folded hoping 2 of them germinate. My Walmart did not have this variety...I will get it online if I can’t find it....I love their peppery smell, the pollinator attraction, and they are super hardy! Go all year! CN, Thank you for bumping this topic. Grrrr! This marigold is NOWHERE in stores around me. Online, it’s $5.29/pack!!!! What? For seeds???? Please keep an eye out if you are flower seed shopping!!!! I saw those at Home Depot this past weekend - I almost bought some. The were in the Burpee rack for $2.49.